Dealing with administrative tasks is an essential part of running any business. While SMEs account for 99.9% of all UK private sector businesses and are key to the country’s economy, their productivity is profoundly impacted by the time they spend on admin tasks. Recent research from Sage looked into the impact of this issue on 3,000 companies across 11 countries. According to the report, SMEs in the UK spend an estimated average of 71 days per year on admin – that’s an equivalent of around three months. Clearly no one starts a business because they want to chase late payments or spend long hours billing clients and chasing invoices. These tasks often take more time than anticipated, distracting focus from the key target – growth. Administrative burden can also lead to significant costs for SMEs, hindering the success of companies. Cutting down on admin hours is therefore essential if you are looking to boost your business’s productivity. Reducing resource spent on admin will give you more time to focus on actually growing your business, attracting new customers and increasing profit. In addition, improving efficiency has a wider impact on the overall economy – as even a small increase in productivity can boost the country’s GDP. The question that remains is simple – how can I reduce the amount of hours I spend on admin tasks? 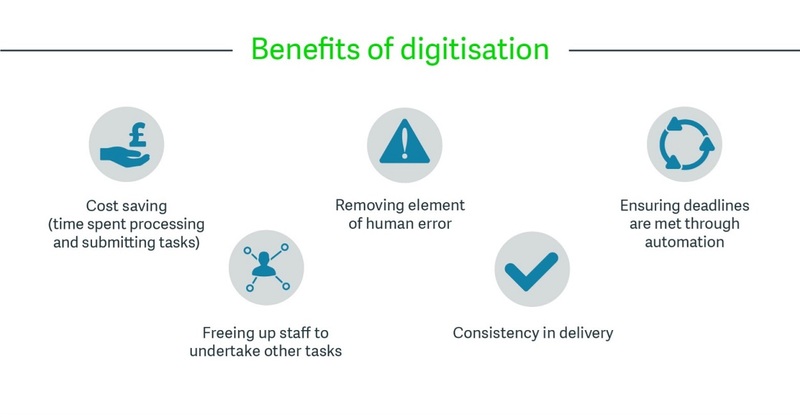 Digitisation is a critical enabler in reducing the admin burden and improving productivity. Although moving to the cloud may seem daunting, digitising your business will give you more time to focus on growth. Moving to the cloud allows businesses to save money by reducing the time spent processing and submitting tasks. 65% of companies believe that digitisation facilitates faster decision making as it allows them to access projects easily online. Working in the cloud frees you up to run your business at any time and on a range of devices, such as your laptop, tablet or smartphone. Completing tasks remotely provides a degree of flexibility and makes it easier to take ownership of your work. Automation tools can improve IT performance by minimising human error, leaving you more time to focus on running your business. Digitisation allows you to view information in real time and to manage multiple projects at once. This will help you keep track of individual contributions to make sure that employees are meeting deadlines. The cloud lends itself to improving consistency of delivery, allowing your business to provide a higher quality of service in the long run. With all the benefits of digitisation, moving to the cloud seems like an obvious solution to the problem of admin burden. However, some business owners are reluctant to take this step, believing digitisation will be time-consuming and complicated. Contrary to these beliefs, embracing cloud services will save you both time and money, while streamlining your business. Many of us already use the cloud in our personal lives, through apps such as Facebook, Google Docs or Dropbox. While you may have to put in effort to become comfortable with this new way of managing your admin, digitisation will save you valuable work hours in the long run. This will allow you to beat the admin burden and place focus back onto your productivity.